Collagen is one of the most plentiful proteins present in the bodies of mammals, including humans. In fact, it makes up about 30percent of the total amount of proteins in the body. Collagen is a type of protein, fibrous in nature, it connects and supports other bodily tissues, such as skin, bone, tendons, muscles, andã€€cartilage. It also supports the internal organs and is even present in teeth. There are more than 25 types of collagens that naturally occur in the body. Some people refer to collagen as the glue that holds the body together. Without it, the body would, quite literally, fall apart. Collagen works hand-in-hand with elastin in supporting the bodyâ€™s tissues. Basically, it gives body tissues form and provides firmness and strength; elastin gives the same body tissues much need flexibility. This combination of collagen and elastin is very important in many parts of the body, including, but not limited to, the lungs, bones, and tendons. Even the blood vessels rely on both collagen and elastin. Who in a right mind would want to lose this essential protein, to cause ourselves an aging effect, wrinkles and sagging on skin, corrosion of cartilages and joints, and so forth? Since collagens are so important within the body, it stands to reason that collagen deficiencies can be problematic. Luckily, modern science has made some amazing discoveries during the last decade, and the products you now find on the market actually can work to reduce the signs of aging, not just cover them up like the beauty products of the past. So what better way to supply collagen and help its metabolism ever active? By taking collagen supplements to enhance proteins metabolism, stimulating and boosting the production of this vital protein. 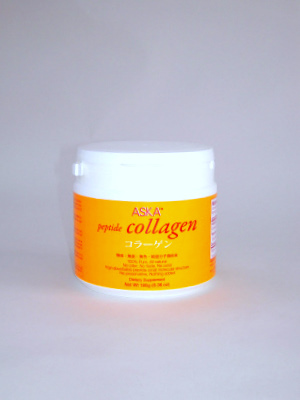 Aska collagen is the perfect way to start and maintain your collagen needs! Suggested Use: The suggested quantity is 3-6 grams a day, of which 1 gram is equivalent of 1 teaspoon. Even if collagen is overeaten, there is no harm as it is a pure protein. It may also be taken safely with other medications. It is more effective to take with vitamin C-rich food as vitamin C is proven to improve the absorption of collagen.